One of the most important and challenging issues of medical imaging field is to achieve state-of-the-art spatial and/or temporal resolution with minimal invasiveness. The main goal of BISPL is to develop novel/improved image reconstruction and signal processing algorithms for the medical imaging systems such as magnetic resonance imaging (MRI), x-ray computed tomography (CT), positron emission tomography (PET), electroencephalogram (EEG), as well as emerging modalities such as near infrared spectroscopy (NIRS), diffuse optical tomography, optical microscopy and etc. Due to the potential risk of inducing cancer, radiation exposure by X-ray CT devices should be reduced for routine patient scanning. However, in low-dose X-ray CT, severe artifacts typically occur due to photon starvation, beam hardening, and other causes, all of which decrease the reliability of the diagnosis. Thus, a high-quality reconstruction method from low-dose X-ray CT data has become a major research topic in the CT community. Conventional model-based de-noising approaches are, however, computationally very expensive, and image-domain denoising approaches cannot readily remove CT-specfic noise patterns. To tackle these problems, we want to develop a new low-dose X-ray CT algorithm based on a deep learning approach. We propose an algorithm which uses a deep convolutional neural network (CNN) which is applied to the wavelet transform coefficients of low-dose CT images. 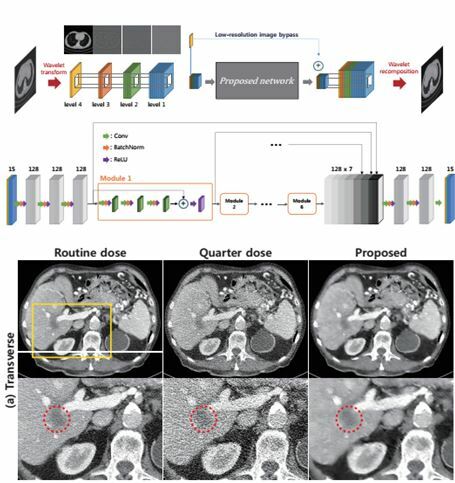 Experimental results confirm that the proposed algorithm effectively removes complex noise patterns from CT images derived from a reduced X-ray dose. Our results were rigorously evaluated by several radiologists at the Mayo Clinic and won second place at the “2016 Low-Dose CT Grand Challenge." 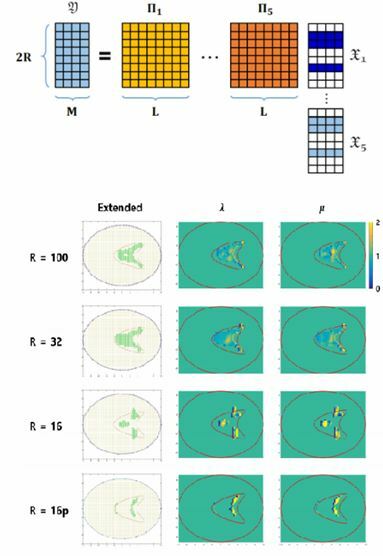 In addition, the proposed algorithm, in contrast to existing model-based iterative reconstruction (MBIR) methods, has considerable potential to benefit from large data sets. Therefore, we believe that the proposed algorithm opens a new direction in the area of low-dose CT research. 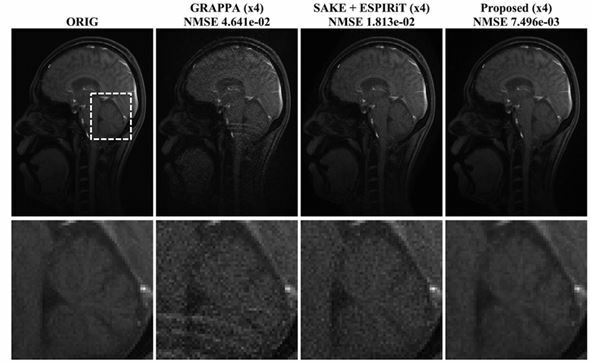 Parallel MRI (pMRI) and compressed sensing MRI (CS-MRI) have been considered as two distinct reconstruction problems. Inspired by recent k-space interpolation methods, an annihilating filter-based low-rank Hankel matrix approach is proposed as a general framework for sparsity-driven k-space interpolation method which unifies pMRI and CS-MRI. Specifically, our framework is based on a novel observation that the transform domain sparsity in the primary space implies the low-rankness of weighted Hankel matrix in the reciprocal space. This converts pMRI and CS-MRI to a k-space interpolation problem using a structured matrix completion. We confirmed that the proposed method, ALOHA, outperforms the state-of-the-art pMRI and CS-MRI. Elasticity imaging or elastography is a set of thriving non-invasive imaging techniques that have led to significant improvements in the quantitative evaluation and visualization of mechanical properties of elastic materials. However, the inverse problem of elastic imaging is notorious for its complexity and ill-posed character. Though many dedicated mathematical and computational algorithms have been proposed over the past few decades, most of the classical techniques are suited only to continuous measurements, which is not practically feasible due to mechanical, computational and financial constraints. We proposed a robust reconstruction algorithm that does not require any linearization or iterative update of Green's function but still allows very accurate reconstruction. This is the first algorithm tailored for parameter reconstruction problems in elastic media using highly under-sampled data in the sense of Nyquist rate, which is not generally tractable by classical techniques. This clearly indicates, in view of the present investigation and the previously obtained results, that our proposed formulation may be so general that it provides a unified reconstruction framework for assorted inverse scattering problems. We have developed biomedical imaging algorithms using compressed sensing theory such as k-t FOCUSS for dynamic MRI which enables us to achieve high spatio-temporal resolution even from undersampled measurements. In neuro- imaging, NIRS-SPM is widely used in 23 countries and hundreds of institutes to analyze brain activity. Recently, we proposed a patch-based image inpainting method using a low-rank Hankel structured matrix completion approach. The proposed method exploits the annihilation property between a shift-invariant filter and image data observed in many existing inpainting algorithms. Also, this annihilation property can be applied to reconstruct undersampled data of many bio-medical imaging modalities. 1. H. Jung, K. H. Sung, K. S. Nayak, E. Y. Kim, and J. C. Ye, “k-t FOCUSS: a general compressed sensing framework for high resolution dynamic MRI,” Magn Reson Med , vol. 61, pp. 103-116, January 2009. 3. J.M. Kim, O.K. Lee, J. C. Ye, “Compressive MUSIC: Revisiting the Link Between Compressive Sensing and Array Signal Processing,” IEEE Transactions on Information Theory, vol. 58, No.1, pp.278-301, 2012. 4. K. H. Jin and J. C. Ye, “Annihilating filter based low rank Hankel matrix approach for image impainting”, IEEE Trans.Image Processing, vol. 24, no. 11, pp 3498-3511, 2015. 1. Jong Chul Ye, Yoseob Han and Eunju Cha, "Deep convolutional framelets: a general deep learning framework for inverse problems", SIAM Journal on Imaging Sciences (in press), 2018. 2. Yoseob Han, Jaejun Yoo, Hak Hee Kim, Hee Jung Shin, Kyunghyun Sung, and Jong Chul Ye, "Deep Learning with Domain Adaptation for Accelerated Projection-Reconstruction MR", Magnetic Resonance in Medicine (accepted), 2018. 5. Joowon Lim, Abdul Wahab, Gwangsik Park, Kyeoreh Lee, Yongkeun Park and Jong Chul Ye, " Beyond Born-Rytov limit for super-resolution optical diffraction tomography", Optics Express, Vol. 25 (24), pp. 30445-30458, 2017. 6. 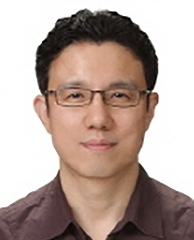 Eunhee Kang, Junhong Min and Jong Chul Ye, " A Deep Convolutional Neural Network using Directional Wavelets for Low-dose X-ray CT Reconstruction", Medical Physics 44.10 (2017)..
10. Jong Chul Ye, Jong Min Kim, Kyong Hwan Jin and Kiryung Lee, "Compressive sampling using annihilating filter-based low-rank interpolation", IEEE Trans. on Information Theory, vol. 63, no. 2, pp.777-801, Feb. 2017. 12. Kyong Hwan Jin, Dongwook Lee, and Jong Chul Ye. "A general framework for compressed sensing and parallel MRI using annihilating filter based low-rank hankel matrix," IEEE Trans. on Computational Imaging, vol 2, no. 4, pp. 480 - 495, Dec. 2016. 14. Juyoung Lee, Kyong Hwan Jin, and Jong Chul Ye, "Reference-free single-pass EPI Nyquist ghost correction using annihilating filter-based low rank Hankel matrix (ALOHA)", Magnetic Resonance in Medicine, Dec 1;76(6):1775-89. 15. Dongwook Lee,, Kyong Hwan Jin, Eung Yeop Kim, Sung-Hong Park and Jong Chul Ye, "Acceleration of MR parameter mapping using annihilating filter-based low rank Hankel matrix (ALOHA)", Magnetic Resonance in Medicine, 2016 Dec 1;76(6):1848-64.